Hypomagnesemia can be broken down to hypo – meaning deficiency and Magnesemia meaning – of Magnesium. So hypomagnesemia basically means low amounts of Magnesium in the blood. Magnesium is a mineral required by almost all of the organs of the body. Heart, Muscles, kidneys, and the making up of teeth and bones cannot do without enough of magnesium in the body. The condition is not extremely common but is also not something one should ignore. With Magnesium deficiency, no one really connects its alarming symptoms as a problem. Reading through the symptoms, one may feel that they already have more or less of these symptoms. But the severity of these determines the level and degree of Hypomagnesemia. It is crucial to get an assessment for the same from a professional practitioner. Usage of AlcoholFor some individuals, even a slight amount of alcohol consumption may cause a deficiency. So it is good to keep a watch on emerging symptoms after a party. Food can help rebuild magnesium levels if the drop is minor. For a Moderate or severe damage to the body’s magnesium stores, it is helpful to take supplements. Magnesium Salts, like Magnesium Citrate, help reduce the effects of a Hypomagnesemia in the body. Zenith Nutrition offers Magnesium Citrate capsules as Magnesium supplementation. It is recommended for people suffering from Hypomagnesemia. As a dosage for rebuilding the Magnesium levels in the body, one capsule a day is an appropriate dosage. Zenith Nutrition Magnesium Citrate is available easily on Amazon.com and other leading medicinal stores. 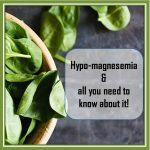 Do SHARE this blog with your friends to spread awareness about Hypomagnesemia. Disclaimer: This post is a Sponsored post, but the views expressed in the article are of the writer alone.